Propaganda can do good when properly executed. I vividly remember a cartoon aired on Sesame Street circa 1985. It was a spit screen of a little boy washing his hands and brushing his teeth on one side with a fish in a pond on the other. As the little boy uses the faucet, the water level in the pond decreases. The little boy lets the faucet run while brushing his teeth. The water reaches dangerous levels for the fish, and it begins to swim about frantically. The narrative tells the little boy to turn off the faucet just in time for poor Mr. Fishey. The moral? Don’t waste water! Be conscientious of how your actions impact your environment, even if it is not in the bathroom with you. That 30 second cartoon shaped my morals as a child and has helped form my adult habits. Every time I turn on a faucet, I think about Mr. Fishey’s welfare. I wash my dishes in a double sink by filling up one sink and rinsing in the second. I turn off my faucet when I am brushing my teeth. I turn off the shower when shaving my legs or deep conditioning my hair. I always, always think about Mr. Fishey; swimming frantically as the substance he depends upon for his very survival is frittered away on my human vanities. 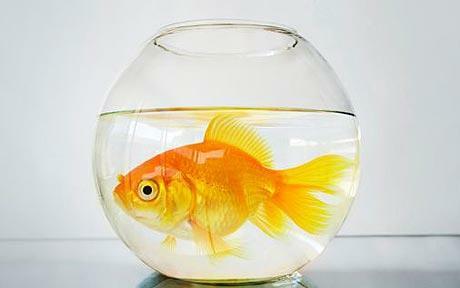 I also think about Mr. Fishey when I observe others using water in my life. Summer is making a slow decent into Los Angeles this year, but already the sprinklers are back in action. And before too long, I suspect we will be hearing public advisories and seeing billboards devoted to drought warnings and water conservation. Riding my bicycle through the more affluent neighborhoods of this city, I see many poorly aimed sprinkler systems watering more pavement (and girls on bicycles) than grass. And I think about Mr. Fishey; and wish that the good propaganda that taught me to be conscientious about my water usage had permeated the practices of everyone. So please, think about Mr. Fishey in your own daily routine. He represents more than just a scaly cold blooded animal cousin or loved fair grounds pet. He represents our whole ecosystem and our impact on the world. It is up to us. Mr. Fishey only has a 3 second memory span. We have no excuse.